for the 2007 season, we flashback 27 years. Back to what many believe was the signature win in FSU football. 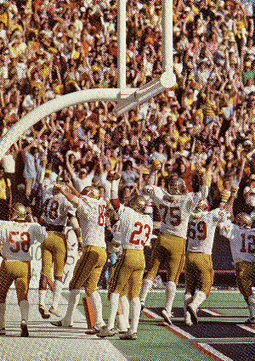 It was October 4, 1980, when the upstart Noles went into the "sea of red" at Nebraska's Memorial Stadium and knocked off the number three Cornhuskers (an ESPN Top 100 Moment in College Football). These play-by-play highlights feature a youthful-sounding Gene Deckerhoff, with color commentary by legendary Coach Bill Peterson. And though it's been nearly 30 years, don't be surprised if the the nail-biting finish keeps you on the edge of your seat.